IB ACIO 2019 General Awareness Questions Provided here based on particular IB ACIO Exam Syllabus. 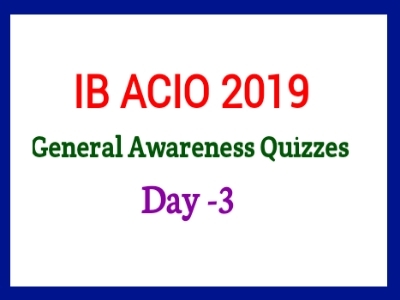 These General Awareness Quizzes help you to better preparation upcoming IB ACIO 2019 Examination. You can regularly attempt our General Awareness Quizzes to improve your knowledge. Which was the first missile boat of India? When was the Communal Development Programme started in India? Which among the following does not belong to the commissioned ranks in the Army service? Which among the following is not a metal ? .When was Integrated Defence Staff created? By which device is the purity of milk measured ? Where is the shrine of Nizamuddin Aulia is situated ?